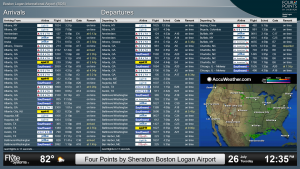 The FlyteBoard digital flight information display shows real-time arrivals, departures and gate information for one or more airports. 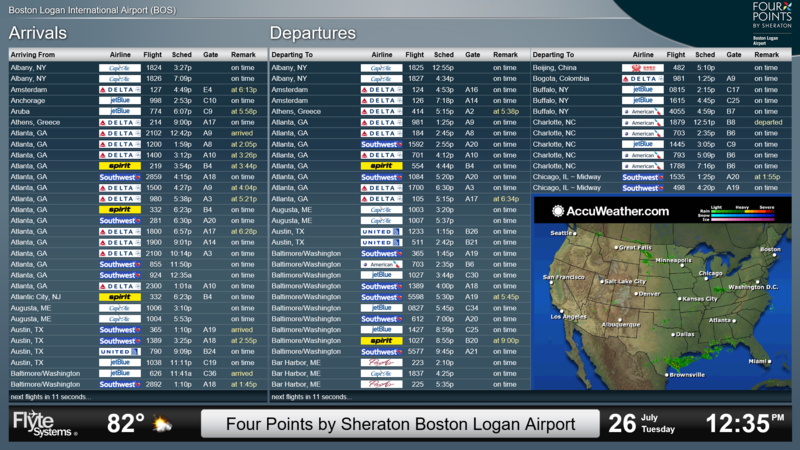 Many properties also add Doppler Radar Weather to FlyteBoard for guest convenience. FlyteBoard may also display property promotion graphics and other revenue generating information. The 180-room Four Points by Sheraton Boston Logan Airport hotel offers business and leisure travelers in Boston a balance of comfortable rooms and an ideal location. The property is conveniently located 4.5 miles from Logan International Airport and six miles from Boston’s many tourist sites, convention centers, universities, hospitals, and sports arenas. It features a Japanese steakhouse and lounge, an indoor pool and business and fitness centers. Its complementary airport shuttle gives guests effortless access to flights. 2019 © Flyte Systems. All Rights Reserved.